Today, I would detail you guys on how to install custom recovery, unlock bootloader and also root OnePlus One smartphones. I would first start with, how you can unlock the bootloader of OnePlus One before we would then proceed to how you can install custom recovery and finally, rooting of OnePlus One smart phones. Step 1» Firstly, download the ADB and fastboot file via here and extract the folder to the desktop screen of your computer. Step 2» Then switch off your phone and boot it to fastboot mode. To boot to fastboot mode, simply hold volume up + power, and you would notice a text indicating “fastboot” which shows that your phone is in fastboot mode. Step 3» Then connects the OnePlus One smartphone to your computer with the use of USB cable. With the above command, you would see the list of connected device on your computer, so your device serial number should appear on the list. Step 6» After the above procedure, then unlock the bootloader of your devic by inputing the below command prompt. Step 7» Once the above command prompt has run successfully, then run the below command prompt. To Enble USB Debugging- Move to settings » About Phone » then tap on Build number 7 times. This would automatically enable all the developers’ option, then you can go back and enable USB debugging via developers option. To Disable CM Recovery Protection- under those same developers options in settings, simply disable “Update recovery with system updates”. 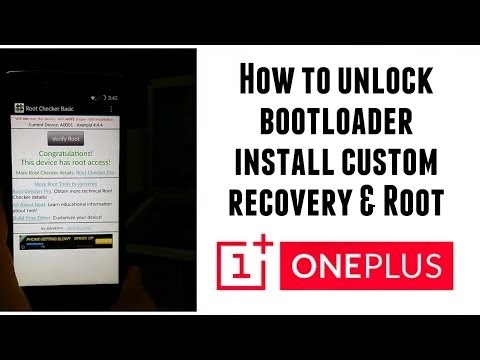 Finally, the bootloader of your OnePlus One smartphone is unlocked; you can now proceed to the next stage of the guide on how to install custom recovery on OnePlus One. Step 1» Firstly, download the latest version of TWRP via here. Step 2» After you have downloaded the file, rename it to recovery.img and move the img file to the ADB folder that you downloaded and extracted on your desktop screen, when unlocking the bootloader of your device. Step 3» Then switch off the phone and boot to fastboot mode, just as explained previously. This process would reboot your device, and it would take few mintues, once the reboot is completed, the TWRP would be installed successfully. Now we can precede to the last stage of the guide on how to root your OnePlus One smartphone. Step 1» First download SuperSU file via here and copy the file to your device. Try to copy the file to where you can easily locate it. Step 2» Then boot your device to recovery mode. To boot to recovery mode, simply hold volume up + power. Step 3» Then at the main screen of the custom recovery, go to install » browse or search for SuperSU.zip and select. Then swipe to confirm the installation and reboot your device. Rebooting your device may take few minutes, once the reboot is successful, and then your root is completed.